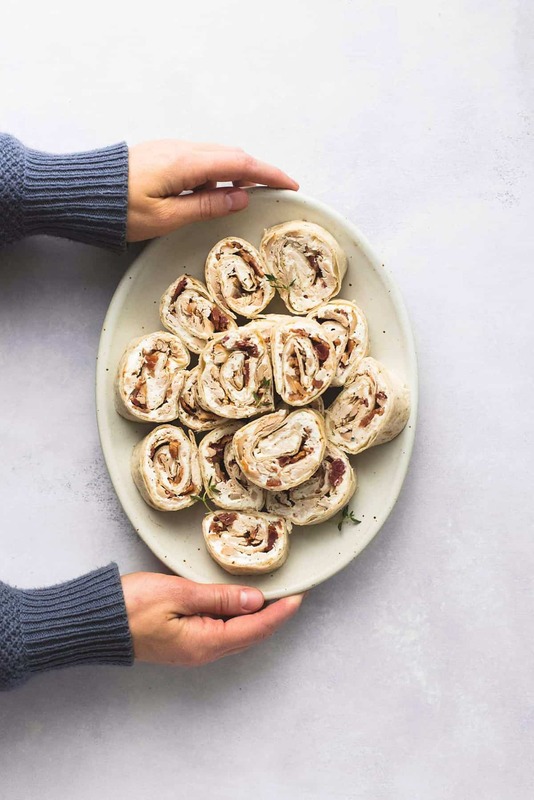 These easy 5-ingredient chicken bacon ranch pinwheels are a tasty no-bake appetizer for holidays and special occasions! Well, it happened. We broke all of our rules and put out the s Christmas tree before Thanksgiving. Usually we have a strict, day-after rule but this year we are exploding with excitement for the holidays with our now two-year olds. Last year was a lot of fun, but this year they “get” things. They recognize Santa and they get excited every time we pass a house with Christmas lights all lit up. They keep saying “gobble gobble” and “ho ho ho” and it is better than listening to Christmas music I swear. The holidays are so magical! I’m officially on appetizer duty for the holidays this year, and I’ve got all my favorites on a checklist, ready to go. 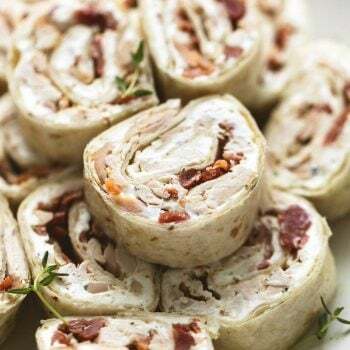 My favorite cheeseball, my mom’s famous spinach dip she made every year since I can remember, and these crazy delicious chicken bacon ranch pinwheels. You can’t go wrong with an easy make-ahead appetizer you can keep covered in the fridge until right before your gathering, then slice and serve in a hurry. Bonus points for only having five ingredients! That’s right, you just need five ingredients to whip up these delicious pinwheels! Just get yourself a packet of Hidden Valley® Ranch Dip Mix and some Glad® Press’n Seal and you’re set. 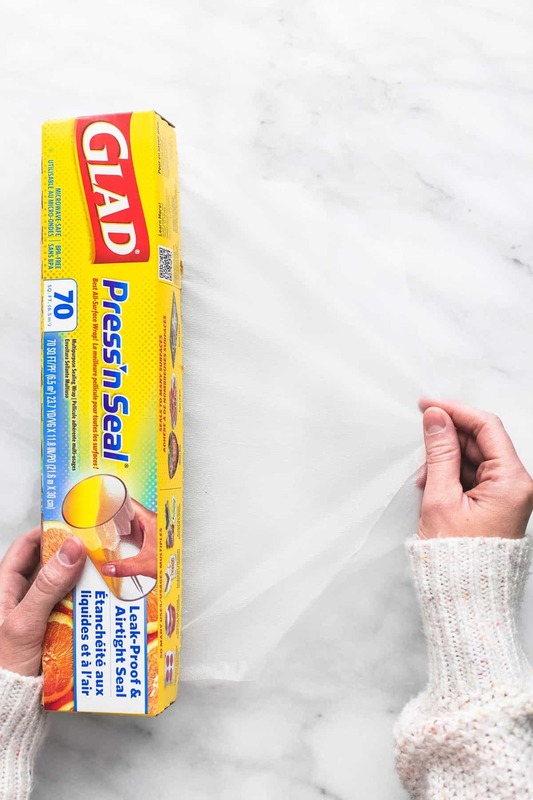 Start by covering your work surface with a sheet of Glad Press’n Seal – two 12-inch pieces should do the trick. Then mix together the Ranch Dip Mix with cream cheese and spread it evenly onto two large tortillas. 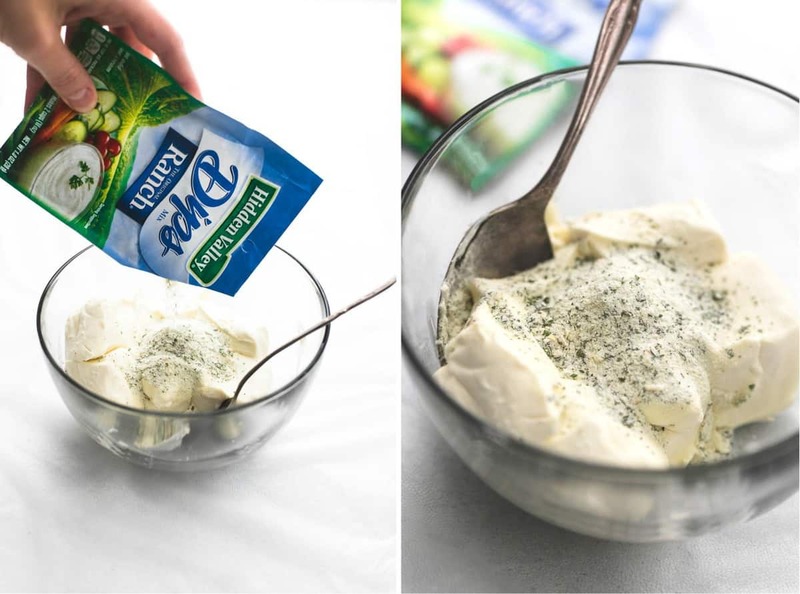 Hidden Valley® Original Ranch® Dips Mix is located in the dressing aisle, next to the dry mixes! Top it with shredded rotisserie chicken and bacon pieces, then roll it up. This is where that Press’n Seal comes into play again because you’re going to use it to wrap around the tortilla rolls and pop it in the fridge to chill. Glad Press’n Seal food wrap is perfect for a custom fit that seals in freshness and protects your favorite foods. It seals in all that goodness til you’re ready to serve! 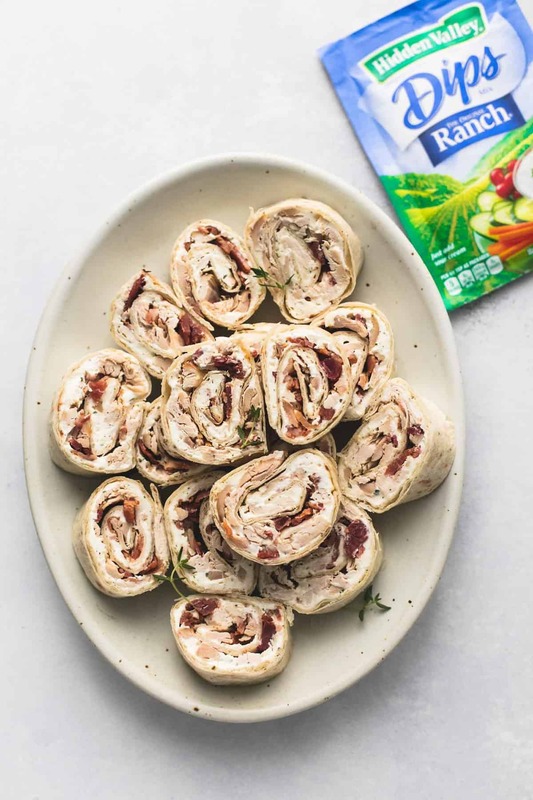 After an hour (or when you’re ready to serve), simply take the rollups out of the fridge, unwrap and discard the Press’n Seal, and slice the rollups into pinwheels and serve. Your guests will gobble up this tasty appetizer quicker than you can say Happy Thanksgiving! Lay a 12-inch piece of Press'n Seal underneath each of the two tortillas In a bowl, mix together cream cheese and Ranch dip mix until smooth. Spread evenly onto the tortillas. 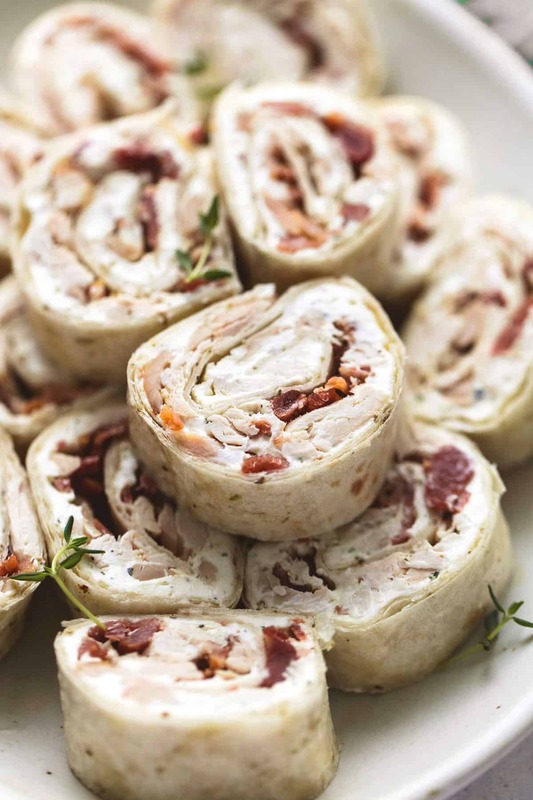 Top cream cheese with shredded chicken and bacon pieces. Roll tortillas up tightly, then wrap the Press'n Seal tightly around the rolled tortillas. Refrigerate for 30 minutes or until ready to serve. Unwrap the Press'n Seal and discard and slice into 1-inch thick pieces and serve. i love YOUR recipes. do YOU have a cookbook FOR sale? Hi Janey – I”m so glad you like my recipes – I have two digital cookbooks for sale on my site through the “cookbooks” link at the bottom of my page. THESE look delicious and will be perfect to have for the holiday GET-togethers! I love that they can be made in advance with no baking! Thanks for sharing the recipe, Tiffany!